(left photo) and PCG student Macey Graham performing on the Opry Mills performance stage (right photo). Helping take the live entertainment at Opry Mills (www.oprymills.com) to an exciting new level, PCG Nashville will select and manage the performers featured at Opry Mills’ indoor stage. Since launching PCG Nashville (www.pcgnashville.com) in 2008, industry veteran Bernard Porter has changed the lives and fortunes of hundreds of established, new and up-and-coming musicians and artists across a wide spectrum of genres. His clients have been featured on “The Voice,” “Good Morning America,” “American Idol” and other shows. 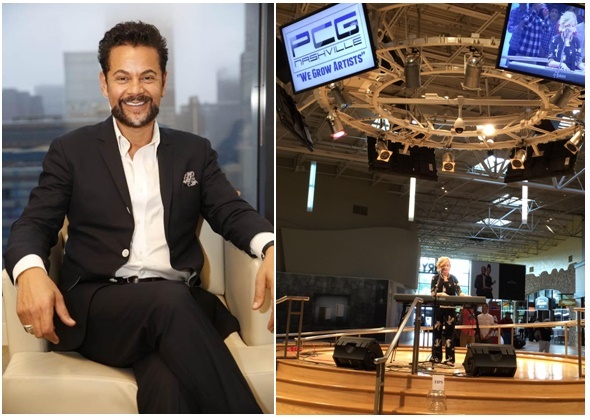 “We are excited to explore other talent opportunities within the Simon mall properties to broaden our reach in helping and educating artists nationwide,” said music veteran and Founder/CEO of PCG Nashville, Bernard Porter. Artists interested in being considered for Opry Mills Unplugged must complete the form on PCG Nashville’s website. Artists must audition before being selected. The audition and selection process is managed entirely by PCG Nashville. The stage is located in the entertainment wing of the shopping center between Claim Jumper and the Aquarium Restaurant. Located seven miles from downtown Nashville, Opry Mills features a great collection of fashion-forward stores such as Polo Ralph Lauren Factory Store, Coach, Cole Haan, Saks Fifth Avenue OFF 5TH, Forever 21, NIKE Factory Store, Gap Outlet, Lucky Brand Outlet and Bass Pro Shops, as well as the state’s first locations from The Limited Outlet and H&M. Shoppers can also enjoy quality dining and entertainment at Rainforest Cafe, Aquarium Restaurant, Dave & Buster’s, and Regal Cinemas Opry Mills Stadium 20 & IMAX. Opry Mills’ famous Entertainment Stage and Tennessee Treasures play area further enhance the family shopping experience. PCG Nashville’s agreement to participate is with Opry Mills’ owner, Simon Malls, a global leader in retail real estate ownership, management and development and a S&) 100 company. Their industry leading retail properties and investments across North America, Europe and Asia provide shopping experiences for millions of consumers every day and generate billions of dollars in annual retail sales.